ORBIS® Corporation, an international manufacturer of reusable packaging and supply chain optimization expert, will be exhibiting at FachPack 2016. There, ORBIS will reinforce its reusable packaging expansion and showcase its growing ability to serve supply chains in the European market. Throughout the event, David Heer, senior commercial director for ORBIS, will be available to talk about supply chain optimization efforts and the ORBIS product portfolio, including European-specific reusable packaging products. FachPack 2016 runs from Sept. 27 to 29 in Nuremberg, Germany. Heer has more than 20 years of progressive management and marketing experience in Europe, Asia and North America, with a high-level understanding of reusable packaging used in food, beverage, consumer goods and automotive industries. With this multi-national expertise, Heer is leading the ORBIS Europe team, including marketing, sales, customer service and operations, with a strong focus on customer relationships, new product development and market expansion. The ORBIS ML6040-325 mini-load multi-compartment tote was designed to interface with many types of automated storage and retrieval systems and shuttle systems found in today’s state-of-the-art warehouses and distribution centers. The tote is available with configurable dividers that create storage cells for efficient picking. Molded dividers fit seamlessly into the container grid bottom, creating up to eight distinct, removable cells, designed to fit a wide range of parts, shapes and sizes. Dividers are held in place on the top and bottom of the tote, eliminating divider movement and product shifting that can result in product loss or damage. The tote also features contoured handles and a reinforced bottom to minimize deflection. Available in four popular heights, the HDB1012 BulkPak is the first heavy-duty plastic bulk container in the industry to hold up to 900 kg. As part of the ORBIS BulkPak series, the HDB1012 BulkPak system was designed as a strong and durable container to better protect and transport parts in global automotive and industrial applications. The HDB1012 containers collapse and stack securely together, allowing for maximum truck capacity while minimizing warehouse space needs. Customizable configurations of the BulkPak access doors and bottom styles accommodate a wide range of material handling equipment, storage and shipping needs. It is an environmentally friendly alternative to steel tubs, wood pallets and crates that saves a significant amount in transportation costs. 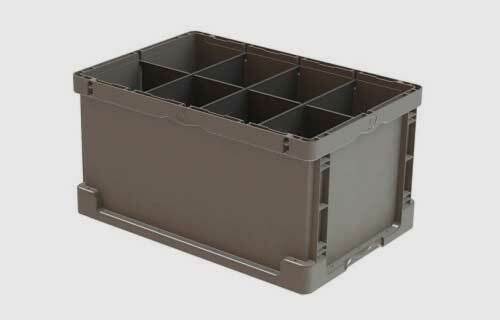 The BulkTote HDRS3016 reusable container was built for long-lasting durability in heavy-duty applications. It is the first of its size to offer fork truck entry on all sides for easier handling and versatile line-side part delivery. This allows double the amount of SKUs and reduces nearly half of all line-side space. Designed to hold up to 226 kg, the 760 mm x 400 mm BulkTote replaces wire baskets, steel tubs or wood/corrugated packaging. The unique fork opening at the top of the container offers the ability to safely present the short side to the assembly line. With the 400 mm side facing the line, more containers can fit on the line, resulting in efficient use of space and a safer environment for workers. The stacking ridge allows for secure nesting when stacked. Weighing just less than 12 kgs when empty, the BulkTote also is easy to handle manually. The FP403 FliPak is ideal for the handling, storage and shipment of large bulky items, as well as small lightweight items shipped in bulk. This 711 mm by 508 mm by 965 mm attached-lid tote offers generous internal capacity for all types of products in the apparel, home goods and automotive aftermarket industries. It is fully compatible with the DFP24-402 dolly to add instant mobility to supply chains. ORBIS beverage pallets are designed to convey filled beverage products, aluminum and steel cans, glass, plastic bottles and can ends on many palletizer and conveyor systems. The nonporous, smooth, one-piece design makes these pallets easy to clean. When combined with ORBIS layer pads and a top frame, a secure unit load is created for stable shipping. During FachPack, find ORBIS at Booth 7-461, where ORBIS experts will be available to provide an in-depth look into the features of the European-specific products being highlighted at the show.